The Japanese blog Egami published the specs of a 17-55mm f/2.8 OS standard zoom patented by Sigma. 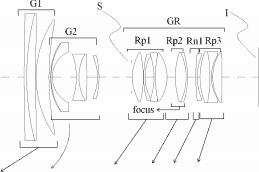 With its 17 lenses (I could not make out the number of the groups) the design registered for patent approval on March 3, 2013, appears to be similar to that of the current 17-50mm f/2.8 OS. In light of the 16-50mm f/2.8 (without OS), which is patented as well, it remains to be seen whether the 17-55/2.8 OS will be brought to market or not. In a Photokina interview with Mike Tomkins from Imagining-Resource.com, Sigma CEO Kazuto Yamaki states that Sigma has received many queries regarding the 35mm foveon and are therefore “studying that challenge”. It’s unclear whether that means that such a sensor is in fact in development and if so, when it will be implemented in a camera. It was also confirmed that the 150-160mm Contemporary will be “significantly cheaper” than the Sports and that it would have just as good imaging performance in the center of the image.